Pumpkin Oatmeal Lavender Bars – Voila! One morning I made pumpkin applesauce muffins. 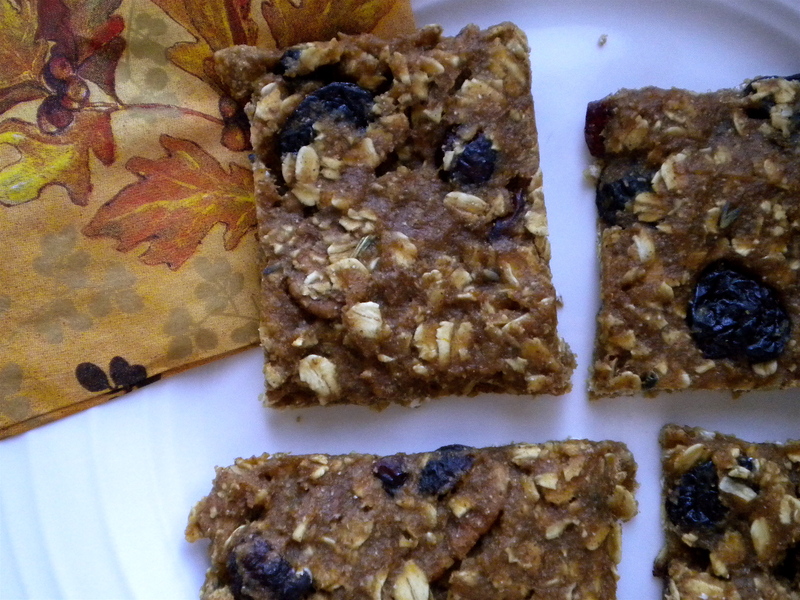 Then I had leftover pumpkin so I made these, which are an adapted version of these lavender cherry oatmeal bars. Then I made raspberry crumb bars. Then I just kept baking all morning. I loved that morning. Music, check. Food, check. Slippers on, check. Relaxation, check. Not only does leftover pumpkin puree make me happy (it’s the little things, folks), but having no other obligations all day except to experiment with food is a great way to spend a weekend morning. 1. In a large bowl combine the flour, oats, pecans and lavender and set aside. 2. In a smaller bowl whisk together the egg, pumpkin, honey and vanilla extract. 3. Add the wet ingredients to the dry. Add cinnamon and cherries/dried fruit, stir together with a large spoon until the dough comes together. 4. Place the dough on the parchment paper. Flatten dough into 1/4 inch thick rectangle shape. Lightly cut with a knife into 9-10 pieces and bake for 10-12 minutes. (Don’t overbake, otherwise you’ll have rockhard oatmeal bars.) Let cool and break the squares apart. Pingback: Lavender Truffles « Voila! Pingback: Pomegranate Spice Bundt Cake « Voila! Pingback: Cherry Chocolate Chip Oatmeal Cookies « Voila!